A ring laser gyroscope utilizes the Sagnac effect. Light travels at a constant speed, unaffected by the motion of the object emitting the light. Because of it, two light beams traveling in a loop, but to the opposite direction will complete the loop at a different time if the loop itself is rotating. Georges Sagnac discovered this Sagnac effect in 1913. In 1925, the Michelson-Gale-Pearson experiment was the first to successfully measure Earth’s rotation using the Sagnac effect. At the time, Laser was not yet available, and they used a gigantic circuit measuring 603 m × 334 m.
In 1960, Laser was discovered. And in 1963, Macek & Davis demonstrated the first ring laser gyroscope. This technology vastly increased the precision, and instruments utilizing the Sagnac effect can be made much smaller. Today, ring laser gyroscopes are used in inertial navigation systems in many airplanes and ships. Large scale ring laser gyroscopes —like several in the University of Canterbury, Christchurch, New Zealand— can even detect the tiny irregularities of Earth’s rotation, such as that caused by gravitational attraction from the Sun & the Moon. 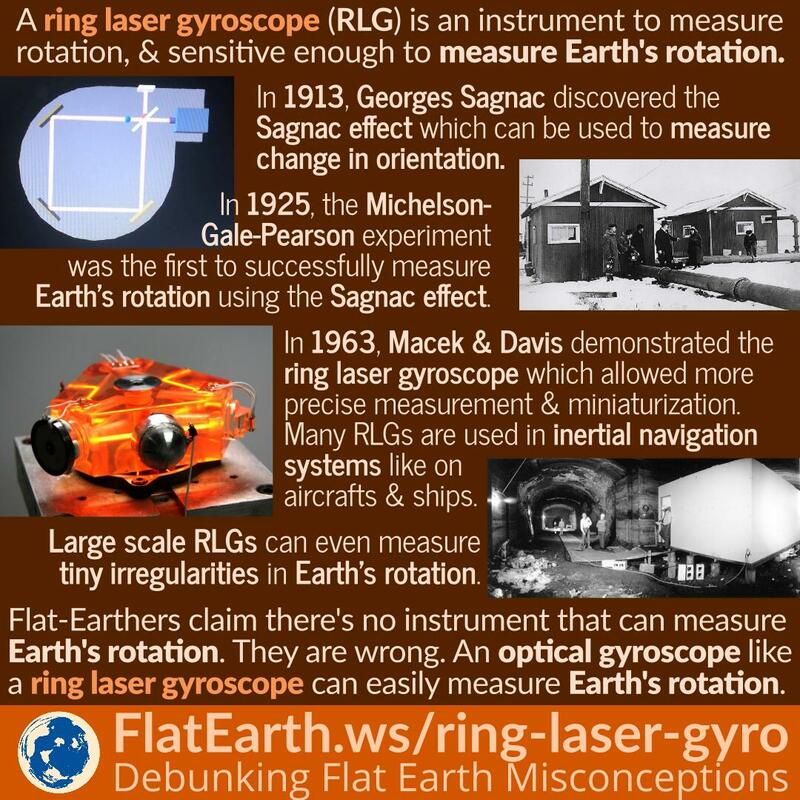 Flat-Earthers did not know such instruments exist, and happy to claim there is no instrument sensitive enough to detect Earth’s rotation. In reality, directly measuring Earth’s rotation using the Sagnac effect was successfully accomplished by Michelson-Gale-Pearson almost a century ago. First ever direct measurement of the Earth’s rotation – Schreiber, K. U.; Klügel, T.; Wells, J.-P. R.; Hurst, R. B.; Gebauer, A. A Study of Ring Laser Gyroscopes – Nishanthan Rabeendran – University of Canterbury.